Did Jesus Return From the Dead? Unfortunately with the time limits on the length of videos on YouTube, the debate has been cut into 12 parts. But I think you'll find the material interesting and important. Mark (last name?) at SacFan went to all the trouble to film and edit this for YouTube. Many thanks. Does 'return from the dead' mean you leave your dead body behind? 1 Corinthians 15 never says that 'dead bodies' rise from the grave, or that dead bodies are raised. Christians claim that when Paul talks about 'the dead' he means 'dead bodies'. This is why modern translations will put the word 'body' in bits of 1 Corinthians 15 where the word is not in the Greek. They claim that if it talks about the dead being sown perishable and the dead being raised imperishable, it must mean 'dead bodies'. So does 'return from the dead' mean 'return from the dead body'? So if Jesus returned from the dead, then he must have returned from his dead body. Of course, Paul says flat-out that Jesus became 'a life-giving spirit', so Christians are desperate to try to find some way of claiming Paul is talking about bodies. Good debate, I thought you both did well, but Russell lost me a bit early on with his "Inference to the best explanation" thing. Just because something is the best explanation I don't see how that means that it's likely to be true. E.g. you could have a pool of 1001 explanations, 1000 of them have a low probability of being true and one of them is twice as likely to be true as the each of the others; you still can't have much confidence that the best explanation is likely to be true; it's the best explanation not a good explanation. Have I misunderstood what "Inference to the best explanation" is? This was interesting. I was disappointed in Russel as he seemed to not have an original thought but was merely parroting William Craig. I liked your presentation as it was somewhat original, at least in terms of the debates I have seen. The weakness was that you tried to cram too much information into a short time. Its better to pick out a couple of your strongest arguments and hammer them home. YOu also made a couple of factual errors which probably no body in the room recognized. If I remember correctly you said the earliest mss. fragment was from 250 CE. Its p52 and its actually from 125-150 CE. But it is only a few verses from John 18. I think, although I can't remember the exact details, that you misrepresented somewhat the way the canon was formulated. All in all, though, you did a great job and I hope this won't be your last debate. I also like the point you made about a person being on trial for murder and the two witnesses who testify against him. That was excellent and I think really brought home to people how truly weak the evidence is. I also liked your point that one does not have to come up with a detailed explanation of the event in order to dismiss it. Just as we don't know how to explain some of the phenomena claimed in Salem, MA , we are still justified in dismissing the witchcraft claim. As you pointed out, the historical evidence is so sketchy and limited with regard to the resurrection, that it is impossible to know exactly what may have happened and how the stories developed, etc. There is just not enough info to go on. "The best explanation of these facts is that God raised Jesus from the dead." WLC uses this same line. But there is a "stacking of the deck" going on here. Maybe the best "single" explanation is God, but there are better different explanations for each of the different facts. To require that one explanation explain the different facts is like requiring one explanation for disease, origin of species, and earthquakes. By the WLC logic, God is the best explanation for disease, species, and earthquakes. Instead of germs, evolution, and plate tectonics. I think, given that the crowd, time limitations, and topic were all working against him, that Prof M did an excellent job. The crowd and time limitations are self explanatory, but the topic is what I believe did the most damage. How can you effectively argue a single point from the bible when you think the whole thing is bogus? It seems comparable trying to argue that Santa Clause couldn't possible carry enough gifts in his bag for every child in the world. In order to have the discussion on that specific topic, Prof M had to implicitely acknowledge that other parts of the bible were true, or at least the supposition of a god was an acceptable explanation. It seemed to make him argue from a point of weakness. Professor DiSilvestro appeared to wallow in a few fallacies while claiming that the best hypothesis was that god raised Jesus from the dead. I agree completely with NAL on that idea. It's completely bogus. I would have really liked to see both presenters push each other a little bit harder (while remaining respectful, of course) to face the others' criticisms. Good point, Foolfodder. I won't concede that the resurrection is an inference to the best explanation, even in the weak sense that you're pointing out. DiSilvestro claimed that the four "facts" needed to be explained and by this principle, the inference to the best explanation was the resurrection. If I deny, and successfully argue (which I think I did) that we should believe these four claims, then the inference to the best explanation never gets off of the ground. Fortune Teller: the best explanation of my remarkable forecasting skills is that I have psychic powers. Skeptic: If there are no significant forecasts of any interest, then there's nothing to be explained with psychic powers. Ken, if you've got a reference to an early Gospel manuscript dated to 125 CE, then I want to see it. I've looked seriously into this question and the oldest extant fragment of a copy of John is from the late 200s. Matthew, thanks for the input. I'm not sure what you mean about accepting other parts of the Bible, but I make no such concessions here. This discussion was about the evidence we have for the resurrection. I took no other stand about the Bible, and it's not accurate, I think, to suggest that I am implicitly acknowledging anything in it. Want to elaborate? Thanks all for watching and thinking about this. There will be more. One of the implicit premises of Dr. DiSilvestro's "four facts" was that god exists. There is no other way to for him to draw his conclusion of the "historical evidence for the resurrection" without that. What I was getting at is: you were forced to argue against his point without touching that particular premise. Doing that seemed to put you in a position of comparative weakness. Had you been able to challenge the IP of god's existence, it would have completely blown his argument out of the water. Without challenging that point, it's a much more difficult argument to make. Your points were much better, and extremely devestating to him, but I think allowing that IP was a bad choice. When discussing historical events, we typically do not allow the presentation of supernatural phenomenae as a legitimate hypothesis. Once that happens you are no longer scientifically addressing historical probability. That's what I'm getting at. The debate was sold as a debate about the historical evidence for the resurrection and the fundamental premise of the one of the presenters was the existence of something supernatural. I dunno, maybe I'm thinking too much into this, but it seemed that his argument was perfect and 100% valid for believers, and yours was perfect and 100% valid for nonbelievers. Neither argument aggressively addressed the premises of the other, though. Like I said before, though, I don't think that was for lack of trying, both of you were severly limited on time. DiSilvestro: There are four facts. The best explanation of these 4 facts , because of X, Y, and Z, is that Jesus was resurrected. McCormick: Jesus couldn't have been resurrected because God doesn't exist. So there's no supernatural being who could have pulled it off. That's a weird, argument changing approach the whole thing. We weren't arguing the existence of God. He would have given an argument for that, if that was his intent. You say, "When discussing historical events, we typically do not allow the presentation of supernatural phenomenae as a legitimate hypothesis. Once that happens you are no longer scientifically addressing historical probability. That's what I'm getting at." But this is circular. The question is: what is the evidence for the resurrection? Your answer: we do not ever allow supernatural claims about things like resurrections as legitimate hypotheses. This approach just dogmatically rejects the possibility. But surely we have to at least admit the possibility that a resurrection could occur. And if it does, then it must be possible for evidence for it to be communicated historically. My argument pulls the rug out by denying that we have any claims that are believable enough to even need explaining. My argument completely nullifies his by removing the four claims that his is built on. But you're right, I certainly should have made that much clearer at several points. Debates formats are strange. Awesome debate! I think this is the best respond to WLC's arguments in the debate yet. Even better than Ehrman's. Now you just need to get a debate arranged! Ken appears to be correct in dating the earliest fragment manuscripts to early second century. Specifically, p52, is dated 125-150. Looking through my books for more "scholarly" sources I was able to find mention of p52 being the earliest known fragment of the Bible as noted in Hector Avalos' book, "End of Biblical Studies," (p.88). However, no dating is given here. Bart Ehrman in "Misquoting Jesus" (p.88) does say that same and provides the vague date of "early second century" which appears to support Ken's post. DiSilvestro sounded just like William Lane Craig. I thought your response to WLC's arguments were great. Now maybe a debate between you and Craig (not just someone else rehashing his arguments) can be arranged! Thanks Toby. And thanks for finding the date on that fragment. The fragments from the late 200s I'm thinking about must be a much bigger document with more of the Gospel on it. This tiny 2.5" by 3.5" scrap makes it really clear just what a tiny foundation the whole edifice of modern Christianity is resting on. Thanks for the kind words. Good to have the work appreciated. My first formal debate. I'm learning. I have no interest in WLC however. I think I understand better. Thank you for clearing that up. I guess I was trying to put myself in the perspective of an audience member (of either side) and seeing which argument seemed more relevent. I guess with your description, it feels like that debate would have been better addressed to a crowd of academics. Historians and such. Do you think that was the correct "crowd" to aim that specific type of debate (historical evidence) to? It almost seems like there should have been two debates. One debate on his points, and one on yours. I don't know how differently that would have worked out, but it may have given more time to address his points specifically, and vice versa. Either way, I'm definitely looking forward to the next one! Did any Christian in the first century name himself as ever having heard of an empty tomb, Joseph of Arimathea, Mary Magdalene, Joanna, Salome, the other Mary, Martha, Judas, Thomas, Barabbas etc etc? These people are as well-documented as the second gunman who shot JFK. How does DiSilvestro explain the undoubted fact that Christian converts openly scoffed at the idea of their god raising corpses? I didn't see that Toby had already posted a link to it. Yes, its a tiny fragment but its signficance lies in the fact that before it was found many scholars dated the Gospel of John to the mid or late 2nd century CE because of its highly developed Christology and its apparent Alexandrian influence (Philo). This fragment has made most agree now that the Gospel probably was written very late 1st century or very early 2nd century. There are couple of other fragments that are dated a little later than p52 but still in the 2nd century. You are right that no full books are found until the 3rd century. Matthew made a good point in the comment section: When discussing historical events, we typically do not allow the presentation of supernatural phenomenae as a legitimate hypothesis. Once that happens you are no longer scientifically addressing historical probability. That's what I'm getting at. The debate was sold as a debate about the historical evidence for the resurrection and the fundamental premise of the one of the presenters was the existence of something supernatural. He is right. Professional historians work under the assumption that the past is like the present and they do not allow supernatural explanations to explain various phenomena. If they were to do that, it would be the end of serious history just as if scientists were allow supernatural explanations in the laboratory, it would be the end of serious science. Bart Ehrman called WLC on this in a debate. WLC responded with Bayes' Probability Theorem to cloud the issue. Since Ehrman was not expert on Baye's Theorem, he sort of backed down. That is where it would be good to have a tag team debate with people from various disciplines. So an anonymous person claimed Jesus was resurrected, writing 70 years after the alleged event. Not even Christians had heard of these people until anonymous unsourced Christians suddenly produced Novels where these people existed. Paul reassures Christians scoffing at the idea that their god raises corpses that it doesn't matter for a resurrection whether or not the earthly body is destroyed. I did a post on your debate on my site and also sent it to Apologetics315.com a Christian site that keeps an exhaustive database of Christian vs. nonChristian debates. Hope it gets some wider circulation for you. I find your take on the Resurrection Hypothesis very interesting. The reason why I started to doubt the Resurrection is because I realized that one of the things it requires in order to be true is the existence of Yahweh. Not just any definition of God is going to do the job. Jesus' life and ministry are tied to the God of the Jews. Postulating any other god would make the hypothesis contrived. And I don't see how someone can show that Yahweh exists. Now concerning your debate, I wished you insisted more on the double standard Christians use when they argue for the Resurrection without taking into account other alleged supernatural events in history that they don't believe happened even if there is more evidence in favor of them than there is for the Resurrection. 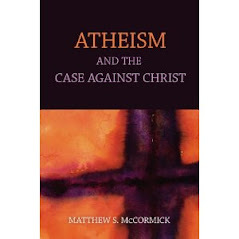 I think your argument could become clearer and more compelling if you focused your attention on the way Christians use various explanatory virtues (like explanatory scope, explanatory power, plausibility and so forth) to conclude that Jesus rose from the dead, and than show how, by approaching the Salem Witch Trials the same way, they would have to conclude that the women really were witches. And while the Christian has to use a double standard if he is to claim that Jesus rose from the dead, but the Salem women didn't have any magical powers, the skeptic doesn't have to deal with this problem. What do you think about this? Now let me congratulate you on a great debate. I think you did a fine job at raising doubt amongst your audience. I hope this won't be your last debate and I'm waiting for your book to come out. Best wishes! I very much enjoyed your approach, particularly when you offered to accept DiSilvestri,s facts if you could add a few more. It has always struck me that the "minimal facts" approach to proving the resurrection is the same kind of argument that wacky conspiracy theorists make. For example, the 911 Truthers present some obscure video clips and some uncorroborated witness reports of noises heard. Then they claim that any theory must explain their cherry picked "facts," and only their cherry picked facts. Not surprisingly, the only theory that does is their theory that the Twin Towers were brought down by a controlled demolition. Of course, when all the facts are considered, those few video clips and reports are exposed as anomalies by the overwhelming evidence that terrorist hijackers were responsible. I would suggest one additional fact to the apologists, and it's a fact that has been accepted by the overwhelming majority of scholars in all fields of science and history: Once you're dead, you're dead. I also liked the Lourdes analogy although I read on Wikipedia that some 7000 "miracles" have been submitted to the Lourdes Medical Bureau for investigation. I don't know whether there is any estimate for miracles that have been claimed but not submitted. Some theist might claim that you are using too large a denominator in your equation although most biblical literalists are Protestants who won't want to give the Virgin Mary credit for any miracles. DM, you seem like a spambot and not a human. But if you're a human: I can get rid of as many of these incoherent spammy rants as you want to post here--that's why God created the delete key after all. Did you have anything interesting or intelligible to say? Talking of delete keys, is it true that 'The Lost Symbol' on Dan Brown's keyboard is the Delete key?